Universal Thumb Splint – Pacific Medical, Inc. 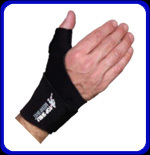 Unique wrap around wrist incorporates compression and control of wrist. Dual stay design allows variations of control based on specific patient needs. Universal in size.